Strong Towns has always been, and hopefully always will be, an intellectual work in progress. In the face of the incredible complexity that is the cities in which we live, we know there will always be more questions than answers, more to learn than knowledge accumulated. The world is full of fools -- many with credentials and advanced degrees -- who believe they have it all figured out. They don't. Neither do we. This essay brought together many of the things we've talked about here in 2013. It is built upon two central insights: first, that complexity and randomness rule our lives whether we understand and accept that or not, and second, that the humans who came before us were forced to adapt to complexity and randomness and one byproduct of that is the enormous productivity of the way they built cities. As the Patron Saint of Strong Towns Thinking, Nassim Taleb, has said, "More Jane Jacobs, less Robert Moses." Professionals in many realms are beginning to grasp the impact that randomness and complexity play in our lives. In medicine, we are seeing antibiotic-resistant bacteria adapt to our treatments. In agriculture, we witness insects and weeds that thrive in the monocultures we plant, resistant to the pesticides and herbicides we have developed. In finance, we have experienced -- and continue to experience -- the impact of too-big-to-fail institutions in the massive distortion of our economy. And in government, we see all too clearly that, even with good intentions, a top-down, centralized approach is inclined to do far more harm than good, squandering this nation's resources in a system that each day seems to more closely mirror the Roman Empire than the Roman Republic. Working from the top down, with efficiency as our greatest value, we can bring about great change in a short time with limited resources. What we give up with that approach is resiliency. Over the long term, it is the slow, messy grinding of bottom up innovation that moves societies permanently forward. More small businesses, less national chains. More neighborhood schools, less mega-campuses. More power for mayors, less power for presidents. More Jane Jacobs, less Robert Moses. America is full of brilliant people, many of them devoted to improving our cities and the lives of those that live in them. The most brilliant innovations in building cities, however, won't come from the current generation of politicians, professionals and advocates. That brilliance is already embodied in the traditional development pattern, a fool proof approach to building places that was developed the hard way: slowly and incrementally over time. If we want build strong towns, we should once again embrace that hard won wisdom. After working for five years as an engineer, I returned to graduate school to get a master's degree in urban and regional planning. My inspiration -- particularly as I was prompted to start my own planning company during my first months there -- was to get out in front of the bad engineering projects I had done up to that point. If we only did a better job of planning (or so I thought) then we wouldn't need to do these heroic and expensive engineering fixes. After working about the same amount of time as a professional planner as I had a professional engineer, I started to have serious doubts about the ability of better planning to solve anything. I had recruited and trained a firm of very intelligent and skilled planners yet we were besieged by all the same shortcomings I had seen others struggle with. In the end, we were just as incapable of doing things any better even though doing things better was the central mission and obsessive focus of our organization. In the dark nights I lay awake pondering what to make of it all, I found myself echoing things I had heard my parents say. They were teachers -- good people -- and when they (and to be fair, their colleagues, whom I also was around a lot while growing up) were frustrated with how things we going, their laments were predictable. It was parents' fault for not having their kids ready to learn. It was administrators' fault for putting so many obstacles in their way. It was the states' fault for cutting their funding or voters' for not approving that referendum. If only these other things would go the right way, they could do their job successfully. Like them, I was doing everything I could with all the best intentions, but I was not getting the results our cities needed. We'd put together that awesome plan and then it wouldn't get implemented (blame the incompetent people at city hall). We'd set up the perfect zoning code and the first application in the door would challenge its underlying principle and the city council would give out a variance (blame the politicians). We'd work on a new development and get it all approved and then it would sit empty for a decade (and still counting) while the city plowed snow off the road so the realtors could show the lots (blame the market or the developer). Worse yet, when things did work out, we credited our own genius for the success. We aren't alone. Go to any American Planning Association conference and you'll experience a lineup of stunning success stories. Session after session tout success after success, sterilizing any unsavory details to create a narrative that is proactive and affirming, as if the unique brilliance of the firm or planner presenting will create outcomes elusive to the rest of us. If only we were all so gifted or could just follow their approach. Here's the important question: Was our success a byproduct of our genius or simply dumb luck? In other words, if we subsidize a hundred businesses, build a hundred business parks, install a hundred miles of pipe, will we not have a success story or two we can point to, one where all the random variables lined up in our favor? One where the voters and the staff and the politicians and the market all randomly came together to birth a victory? These are thoughts that turned me towards what eventually became Strong Towns. I could accept the fact that my failures were the byproduct of bad luck; things that were outside of my control. Could I also accept the fact that my successes were quite likely a byproduct of random fortune as well? And if so, what does that really mean in terms of what I should be doing or can actually hope to accomplish? Those are not very comforting questions. As planners or engineers, as politicians or advocates, we want to believe there is a certain amount of control we can exercise, that our efforts and dedication constitute the determining factor in our success or failure. The entire you need to spend money to make money meme set me off earlier this year (and continues to make my blood boil) because of the sheer arrogance of the notion. I'm a brilliant professional who knows best so I'm going to spend your money and, if it doesn't work out, I'm just going to blame the failure on your inadequacy or some other factor outside of my control. After all, you need to spend money to make money, sucker, and I did my part. What would a different approach look like, one that didn't rely so much on either sheer genius (real or imagined) or on dumb luck? It just so happens that the traditional development pattern is such an approach and, as you will see, it has the breathtaking genius always found in a natural ecosystem that has evolved over thousands and thousands of years. For millennia, around the world, in different cultures, different continents and different climates, we built places scaled to people. It has only been the last 60+ years that we in North America gradually stopped walking and started driving. For thousands of years prior, we walked everywhere, and so our places were built around people who walked. While there were many variations on the theme, the spacing, scale and proportions of these places were very similar to one another. They key insight here is that the knowledge for how to build this way -- those fundamental underpinnings of spacing, scale and proportion -- does not descend from a theory or a brilliant individual but from a collection of natural experiments that occurred over and over again for thousands of years. In other words, people suffered and even died trying different things, figuring out how to build places that would endure. The places that endured long enough to be copied were the ultimate strong towns. They were resilient politically, socially, culturally and financially. It is that last point I want to demonstrate today. The financial strength of the traditional development pattern is still visible today because the remnants of places built in that style still exist in many of our cities. Joe Minicozzi, one of today's most brilliant communicators, has taken data from all over the country and created amazing maps that show the financial productivity of different development patterns. He and I did some work in North Carolina earlier this year where he presented this map of High Point. 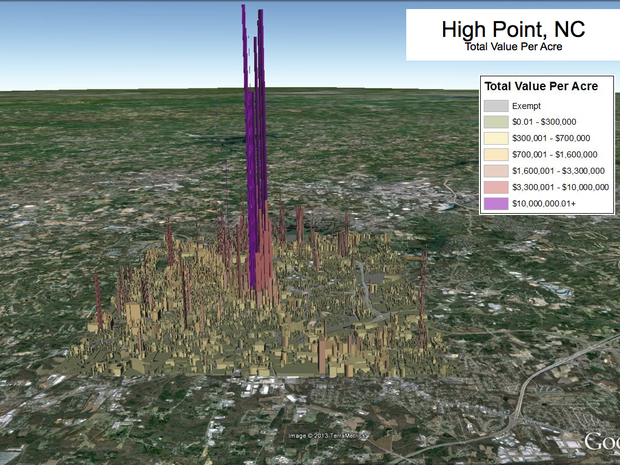 The map shows financial productivity -- total value per acre -- of each parcel in the city with the height of the line representing the comparative productivity. The thing that is most stunning about this is how dramatically more productive that traditional development pattern is. It is not just marginally more productive, it is many, many multiples more valuable than everything else on the map. Let's look a little deeper. Some of that low productivity stuff on the edge of town includes the new, marquee investments in this area. For example, here is the value of the Big K and the Wal-Mart, both new facilities that represent large investments made in the auto-oriented style. You can picture the planners, engineers, economic developers, politicians and everyone else involved in making these happen touting them as sound investments. Jobs, growth and opportunity. Here's one of those high-yielding properties in the traditional development pattern: Jimmy's Pizza. Jimmy's Pizza is likely nobody's idea of success and probably is never held up as a model for High Point (until Joe came to town, that is), yet the numbers don't lie. It is vastly more productive than the K-Mart or the Wal-Mart. Vastly more productive. Jimmy's Pizza represents the base unit of development in the traditional development pattern. It is the cheap little box that was the first increment of investment for cities everywhere. It is so simple to build that you literally couldn't mess it up. And look at how productive it is. You take 14-acres and build a Big K, you'll have a site worth $5.4 million. You take 14-acres and build in the most basic increment of the traditional development pattern, an approach embodied in Jimmy's pizza, and that same area is worth $48.3 million. It is so simple you can't screw it up. Of course, I could pile on here. How do you expand and improve a Big K? You don't, but there are thousands of ways to improve Jimmy's Pizza (few that require professional "expertise" or even more than a moderate level of competence). If your Big K fails, we can blame whoever we want, but we still have an economic disaster. If Jimmy's Pizza fails, well....that building can be transformed into about anything. Give it some time and a surrounding neighborhood full of people on foot and that invisible hand will figure it out (if our antiquated zoning codes don't prevent it). The traditional approach is, in a sense, foolproof.